Sir Alex Ferguson has identified three players he wants to sign for Manchester United before the start of next season. "We've outlined three targets and chief executive David Gill is aware of them," said the United manager. "When there is competition for the best players, it costs, so we will just have to wait and see." The Premiership champions have been linked to Bayern Munich midfielder Owen Hargreaves, Southampton defender Gareth Bale and Tottenham's Dimitar Berbatov. But Ferguson expressed his concern that United could be outbid by Chelsea if the London club moved for one of the players the Scot wants to sign. Who should Man Utd sign? 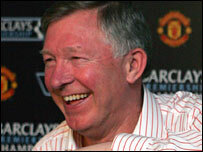 "Manchester United has always been an attraction," added Ferguson, who has led United to nine top-flight titles. "We have 76,000 people watching us every week and have a celebrity status, which means we are known throughout the world. "It is not a question of attracting players. The real competition comes when Chelsea pay £27m for someone like Michael Essien. They can outbid us all."